Responsibilities: Day to Day Human Resources functions such as Employee Relations, Talent Acquisition, Benefits and Compensation in addition to working with the Executive Team and Leadership Team on Organizational Design, Leadership Development, Performance Management and Culture enhancement. Since I joined last September, I have learned so much about our mission, strategy and history of our group. I am even more excited about the opportunity and choice I made to be a part of such a great cause, as well as meeting and working with such talented and passionate staff! What have I done in my life that I am most proud of, that people may not be aware of? Absolutely, hands down, being a Parent and now a Grandparent! My husband and I have experienced such joy in raising and watching our three wonderful children grow and become awesome Adults! All have completed their educations, secured wonderful careers and met and married, or is in the process of getting married, wonderful partners. My husband and I love to travel (our family is spread out around the country), and are big sports fans; mainly College Football (Go BUCKEYES) and the MLB (Go Reds!). WE have had our own “travel team” to go to away OSU games over many years. We have had family members and friends join us. If you ever have the opportunity to go see the Buckeyes play at another venue, I highly recommend it! 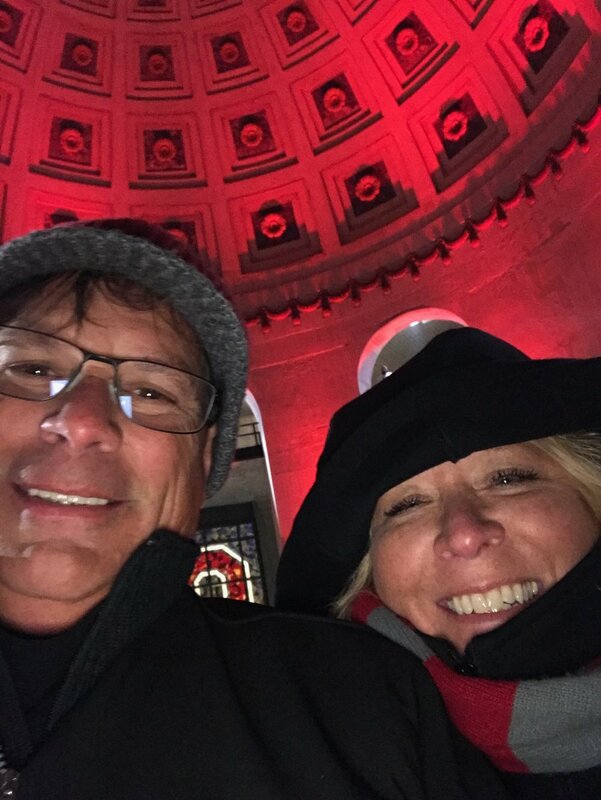 Lisa Roberson at Ohio Stadium with husband Tim. My Husband Tim! We met in the summer of 1985 and have literally been together ever since. He is my hero, my rock and my forever partner/team mate. Together we have accomplished amazing things that I would have never have been able to do alone. I also have to give a big shout out to my Parents, who, without their mentorship and support, I wouldn’t be who I am today, love you Don and Janet! OMG, it’s HOME! I have moved away, parts of family have moved away, but most of us have returned to the great Buckeye State and Central Ohio. It’s a great place to raise a family, it has sports, entertainment and some of the best restaurants around! It’s also a central point or Hub to many locations to travel! I love the fact that I now work for an Organization in Central Ohio called “HOMEPORT.” How fitting is that?